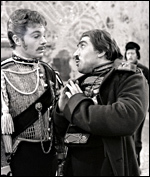 Surprisingly, given the perennial stage popularity of one of Shakespeare's sunniest and most quotable comedies, this BBC studio recording of Franco Zeffirelli 's famous National Theatre production appears to be the earliest British television broadcast of the whole play. It was believed lost for many decades until a copy was discovered in the vaults of the Library of Congress in Washington in 2010, having originally been supplied by the BBC for the PBS public broadcasting channel. The original production was unveiled on 16 February 1965, and by all accounts was an irreverent riot of colour, costume and music (by Zeffirelli 's compatriot Nino Rota , recycling themes from Federico Fellini films). Lead actor Robert Stephens confirmed that "Zeffirelli wanted the audience to go out after the play feeling that they had had a holiday", although this approach proved controversial at the time, with some critics complaining that the original text had been swamped by the carnival atmosphere. Robert Stephens and Maggie Smith weren't married at the time of broadcast, but they were already a couple, and tied the knot a few months later. Their widely-known offscreen relationship adds a frisson to their early scenes, when they hurl waspish insults at each other. Smith is particularly good at this (Beatrice proves something of a natural role for her), while Stephens ' jocular Benedick bears a passing resemblance to Peter Cook , then at the height of his television fame. The Mediterranean atmosphere was partly created by having some of the actors play in Italian accents. This had mixed results - in particular, Derek Jacobi 's Don Pedro would probably have been more convincing if played with his natural voice. Ronald Pickup is a suitably dastardly Don John, while Frank Finlay and Graham Crowden contribute delicious cameos as incompetent constables Dogberry and Verges. The sharp-eyed may also spot future stars Michael Gambon and Christopher Timothy in the background. While Cedric Messina and Alan Cooke (who adapted the play for television) were forced by the technology of the time to sacrifice the original's gaudy colour scheme, they opted to shoot it with highly mobile cameras, diving into the crowds before pulling back to reveal more elaborate stage tableaux - often involving extras (credited as 'The Inanimates') pretending to be classical statues. Despite many of the actors being veterans of the original production, it took more than three weeks of rehearsals to get the elaborate stage and camera choreography in perfect synchronisation.